Monarch Market has been Dayton, OH’s most well-known and loved migrating vintage boutique market. They’re proud to provide merchants with a truly unique array of vintage-inspired items and home furnishings and are excited to announce that they’ll now be moving to a permanent location. The project—called Shoppes to Inspire—brings together a number of like-minded vendors and merchants under one roof, creating one of the most unique shopping experiences in the Tri-State area. 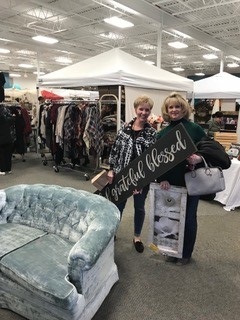 Owner Marcie Brow and partner Ashley Smith of Monarch Market & The Rusted Marquee—a division of Another Adventure LLC—believe that small businesses and migrating vendors have so much to offer to their loyal customers, as well as each other, which is where the idea for Shoppes to Inspire was born. By moving Monarch Market to this location and joining a variety of other like minded curators, they can work together, inspire one another, and bring creative minds together to better serve shoppers and each other. Their 9000-sq. ft. facility will open with 70 vendors, creating an unrivaled shopping experience. Shoppes to Inspire can comfortably hold up to 80 vendors, and Marcie invites you to join if you’re interested in adding your small business to the community. The facility will have a soft opening on June 20th, and the grand opening will be on August 3rd, tax free weekend in Dayton, Ohio. You’ll have access to new customers, a unique space to showcase your items, and most importantly, be part of a thriving and creative community. Monarch Market offers boutique fashion/accessories, vintage products, furniture, uniques finds, and home décor for everyone through their vintage inspired boutique marketplace. Whether it's small or large, you’ll find something to cherish from their ever-changing collection. Stop by Shoppes to Inspire this Summer after the doors open June 20! You can also visit their website and Facebook page for more information about becoming a merchant alongside their vintage boutique.